Clarets striker Sam Vokes can’t wait for another tilt at the top flight with Burnley. Vokes’ 15th goal of the season saw off QPR at Turf Moor to confirm promotion back to the Premier League, and his 16th put them ahead as they sealed the Championship title with a 3-0 win at Charlton Athletic. 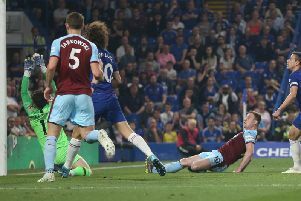 Two years ago, after netting 21 goals, Vokes was cruelly struck down in his prime by a cruciate knee ligament injury, and missed the last six games as Burnley finished as Championship runners-up behind Leicester City. He returned on Boxing Day in the Premier League, scoring against Spurs in the FA Cup third round, but admits he is only now back to his best, and he feels better equipped to make an impression this time round: “Although it was nine months on the pitch, I think it took a good 18 months for myself to get back to where I feel I’m back to now. “Hopefully I’ll have a good summer and get ready to come back and go again in pre-season. It’s been brilliant since Christmas. I feel really good. Twelve of Vokes’ 16 goals have come since Christmas, as Burnley compiled a 23-game unbeaten league run to take the title, and getting his hands on the trophy known as “The Lady” was the icing on the cake: “The QPR game was massive. You could feel the pressure around the place on the day. We just knew we needed that one goal to unlock them and to get that goal was an amazing feeling. “It tops off a great season. We went into the Charlton game knowing if we got three points then we’d have the trophy in our hands. And does it feel better than two years ago? “I think it does. It puts the shine on it. “It was a great achievement two years ago - we were a different kind of team then. We were underdogs but this year we were very much the favourites I suppose in this league and it’s a different kind of pressure.